Introducing workcells into a facility can have a huge impact. Among the many benefits are cost savings, increased productivity and gaining back valuable workspace. A custom workcell is a logically and strategically arranged work unit used to manufacture a certain product or a range of similar products. 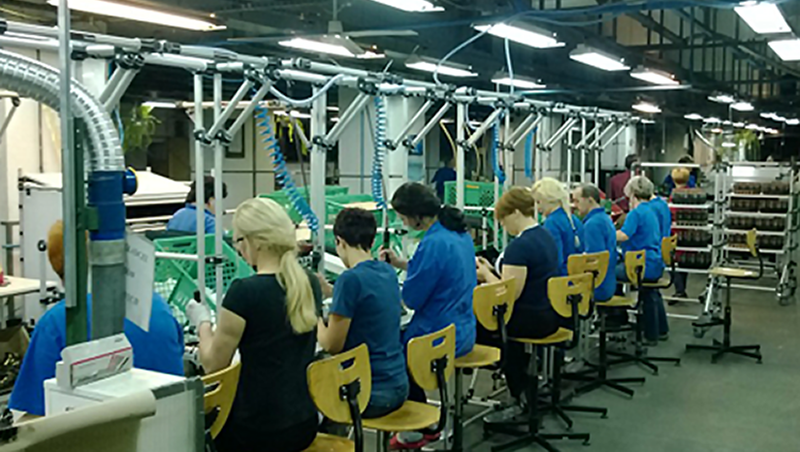 Custom workcells are usually larger than one workstation, but do not take up the entire production floor. They are used to combine a team of people who share a common goal in one specific area with the added bonus of improving communication and promoting teamwork. Custom workcells are often incorporated into manufacturing facilities to improve process flow, quality and speed, and to reduce costs. 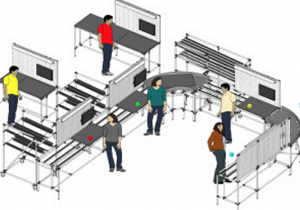 Moving several previously spread apart workstations into one compact area will give clear space-saving benefits. The space saved creates more room for additional cells, thereby increasing production capacity. In a manufacturing facility, the equipment involved in the production process should be arranged so that the goods being produced move smoothly and seamlessly from one stage to the next. This is made possible when the equipment is grouped in workcells that facilitate the logical progression of the goods being produced – from raw materials at one end to the finished product at the other. Similarly, in the office context, workcells may facilitate collaboration with a better flow of communication and more efficient use of shared resources. A customised workcell combines the benefits of a pre-engineered cell with the flexibility of a custom solution. This flexibility allows assembly lines to evolve at a manageable pace, changing easily, making this the perfect solution for lean manufacturers who favour a smaller capital expenditure. With several stations in one area, products spend less time travelling from one station to another. This is important for finding defects quickly. Rather than having product move to another area in the plant, and sit for a prolonged period before inspection, it moves quickly from one station in the cell to another, and defects are seen immediately. Not only does this increase quality, it also saves time and money. To the left is a concept layout for a custom workcell. This shows how four different stations are combined into one compact area, while still giving operators enough space to perform their tasks. Workstations for the four operators were previously spread apart, taking up more space in the plant, and adding movement waste. Parts had to be transported from one workstation to another. This workcell allows parts to be pushed onto the next operator immediately, saving time and effort. The closeness of the operators and constant movement of parts allows quality issues to be identified quickly. For example, when in separate workstations, the operator in spot 1 may work on widgets that get stock piled and eventually moved to operative 2. This could mean several hours until operator 2 spots a quality issue. In the example workcell, operator 1 is constantly pushing widgets down to operator 2, who will spot quality concerns immediately. While workcells do not have to be built with tubes and brackets, using a modular approach will ensure the cell has the flexibility to be easily reconfigured for changes in production and processes, meaning a better return on investment long term.